Recently, I’ve been writing up plenty of rye whiskeys (see here, here, here, here, here, here, here, here, here, here, here, here, and here) in order to put together a Rye Guide along the lines of our A-Z Guide to Bourbon. As you can see, I’ve covered quite a few ryes, but I recently noticed one glaring omission: Sazerac Rye. Sazerac, along with Rittenhouse and Bulleit, are three affordable rye whiskies ($20-30) that are staples at my bar. Unlike Sazerac 18 or the highly sought-after Buffalo Trace Antique Collection, standard-issue Sazerac Rye (sometimes called “Baby Saz”) is distilled at the Buffalo Trace Distillery and aged six years before being bottled at 90-proof. Another member of the Buffalo Trace Antique Collection, Thomas H. Handy Sazerac Rye, is essentially a barrel-proof limited release of Baby Saz. 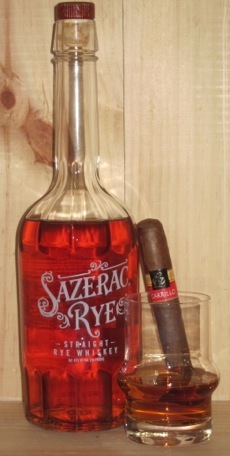 Sazerac (along with Handy) is reportedly made with a mashbill of 51% rye, 39% corn, and 10% malted barley. It features a bright amber color and with a nose brimming with fresh, floral notes and hints of licorice. On the palate Sazerac shows a nicely balanced combination of buttered popcorn, toffee, and clove with bit of pepper. The finish has caramel and baking spices. Is Sazerac Rye going to blow your mind with its amazing-ness? Probably not. But it’s very enjoyable and an obvious standout value at $25 a bottle. It’s a versatile rye that’s plenty good enough to be sipped straight (as I recommend), but you wouldn’t be heart-broken if your buddy throws a bunch of ice cubes in it or decided to mix it into a Manhattan. Naturally, it goes great with a fine cigar. I’d recommend a balanced, medium-bodied smoke. Specific recommendations include the Arturo Fuente King T Rosado Sun Grown, Illusione Epernay Le Matin, or the Tatuaje Black. 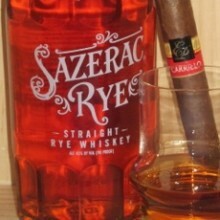 If you’re a rye fan who hasn’t tried Sazerac Rye, you’re missing out. There are very few better ways to spend $25 on a whiskey of any kind. The only problem with this article is that the more people know about Baby Saz, the harder it becomes to find. Already it is sellin out quickly or is being marked up to $35 or more.